9. I know that coughing is natural, but it bugs the crap out of me. 10. I am so glad I'm at number 10 right now. My list making is over. 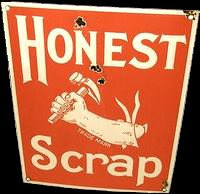 "Scrap means left-overs, fragments, discarded material. Many times truth and honesty is discarded material, considered fragments and left over. So, we need to tell it like it is, and let the scraps fall where they will."